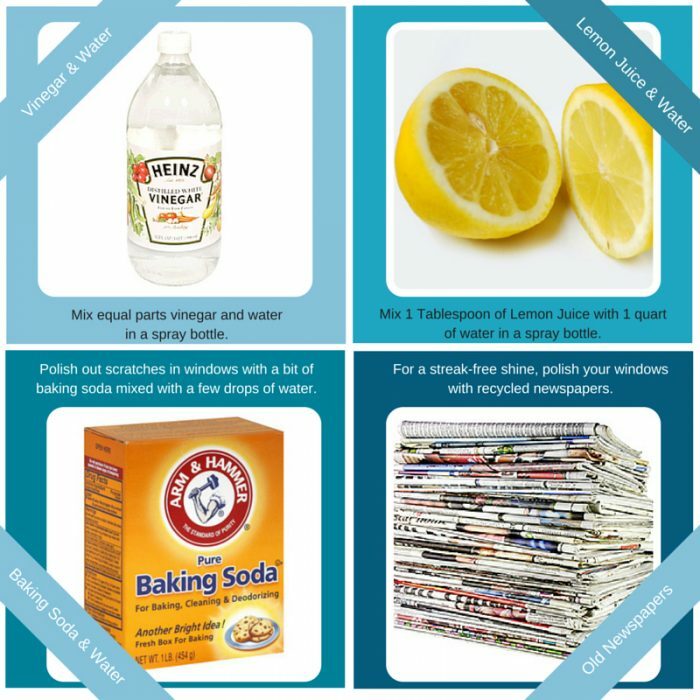 We all know there are hundreds of window cleaning products on the market that promise to protect your windows and make them sparkle and shine, but so many of these products contain toxic chemicals, or are created by companies with much less than admirable environmental track records. So when you’re sprucing up your yard this spring and notice your windows could use a cleaning, consider eschewing the store bought cleaners for homemade and natural products. Vinegar, Lemon juice, & Baking Soda are Nature’s best cleaning agents! They are nonabrasive (even mild abrasive cleaners such as Soft Scrub can scratch the of your new replacement window’s glass or frame), they cost next to nothing, and they are completely nontoxic to humans, pets, and the environment. *Mix ¼ cup Vinegar, 1 Tbsp Cornstarch, 2 cups Water for an excellent window cleaner. *Polish out scratches in windows and glass surfaces using toothpaste or baking soda mixed with a few drops of water. Polish your windows with recycled newspapers or coffee filters! choice? At Clear Choice we are committed to reducing our impact on the environment. Will you go green with us?